In late 2008, Hurricane Gustav hit the Gulf Coast and Mahaffey was called to action to install temporary buildings. 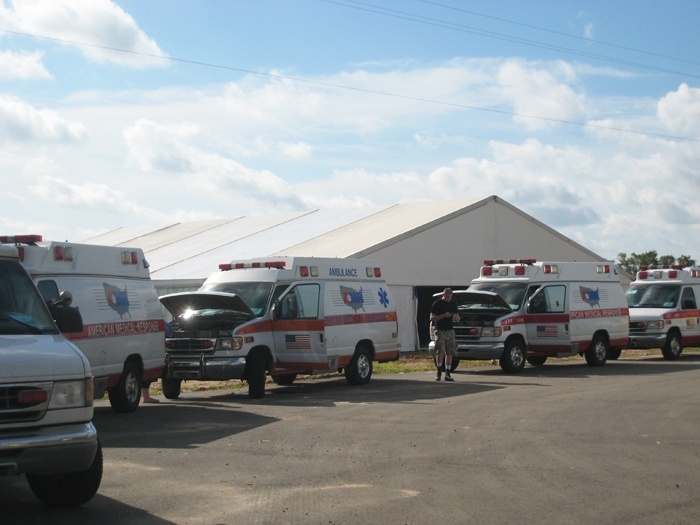 Mahaffey held a contract to provide emergency camp services for a client with multiple facilities along the Gulf Coast. Our contract required us to provide a complete camp to meet the needs of 250 occupants. The camp consisted of sleeping facilities with HVAC and flooring, dining facility, restrooms, showers, generators, and water services. The contract required the camp to be operational in 72 hours. A large hurricane was bearing down on the Gulf Coast and the client mobilized our team to provide services for the New Orleans area facility. The hurricane shifted course before landfall and the Baton Rouge area was badly damaged. The client had a facility in the Baton Rouge area and then requested that we mobilize for Baton Rouge and not the New Orleans facility. Mahaffey had developed mobilization plans for each of the client's locations. There was a timeline along with a pre-approved site layout at each of the client's facilities on the Gulf Coast. We had a an organized plan and knew the intended install location at the New Orleans area facility. However, the hurricane had other plans and changed course after the client had mobilized for the New Orleans location. The New Orleans location was spared of any destruction; however, the clients’ Baton Rouge location experienced significant damage. The client then requested that we mobilize near Baton Rouge. Since the Baton Rouge facility was inland, the client did not deem it a priority location and Mahaffey had not conducted any site evaluations for this facility. Therefore, we would be mobilizing and installing at an unseen site. The primary challenge was the last minute switch in location from the NOLA area facility to the facility near Baton Rouge. This decision was made the day after landfall. Mahaffey arrived at the site early the following morning. Immediately, a quick layout was developed that made use of the limited hard stand area. The hard stand was used to site the mobile trailers and the surrounding field area would accommodate the sleeping tents and dining facilities. All of these decisions had to be decided and executed while we re-routed trucks that were going to the New Orleans area. Additionally, everything was staged in Alexandria, LA, which was supposed to be north of the intended track. Since the storm changed course, Alexandria was unexpectedly caught in the northern side of the storm. This wreaked havoc on the staging team. The Mahaffey install teams were able to complete over half of the sleeping facilities complete with flooring and HVAC by the end of the first night. This allowed the arriving repair teams to have a good night’s sleep after having a hot meal. The next day, shower facilities arrived and much of the camp was in place. At the close of 48 hours, the camp was virtually complete. Mahaffey was able to quickly provide a complete camp that allowed our client to focus on the repair and recovery of the facility that was impacted. Their crews had all of the essentials needed in order to ensure that they were rested and ready to work each day in order to bring the facility back up to speed. 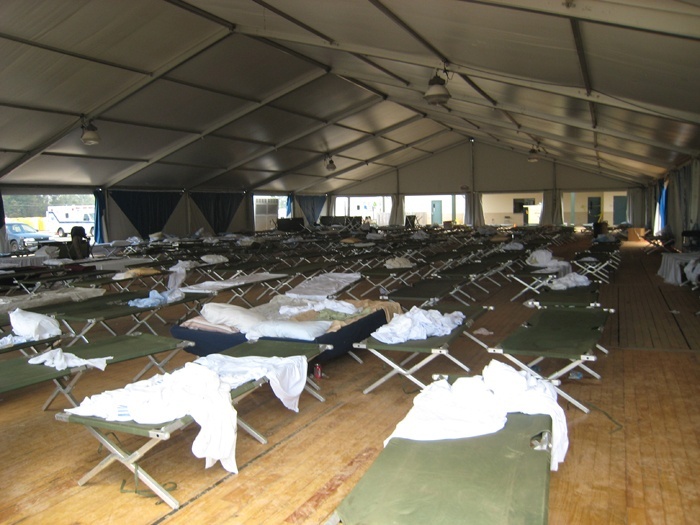 In the end, Mahaffey provided the customer with multiple temporary structures including dining facilities and sleeping quarters, portable restroom and shower trailers, water services, laundry facilities, power generators, light towers and a multitude of accessories for the fabric buildings. Mahaffey’s ability to respond to changes enabled our client to meet their unforeseen needs. Our flexibility allowed us to switch gears and assist our client despite the fact that we mobilized and intended to install at an entirely different facility. Additionally, our ability to move the camp would help the client beat the needs of another facility. Mahaffey rose to the challenge and helped our client get two facilities back on track in despite the impact of two large hurricanes. Interested in learning more about tents and temporary structures for disaster relief, or want more information about how you can get a custom fabric building for your needs?